Dedicated Real Estate Attorney Serving Darien, IL 60561 | Fournier Law Firm, Ltd.
With a flourishing Farmer’s Market at Darien Community Park and fun local events like Darien Fest and the Fishing Derby, it is easy to see why families and businesses settle in Darien, IL 60561. If you are looking to buy or sell real estate in this desirable community, the legal team at Fournier Law Firm, Ltd. will work with you to make sure your transaction proceeds as smoothly as possible. Our real estate attorney has more than 15 years of experience anticipating and resolving the issues that property buyers and sellers face. Whether you are buying or selling a home or commercial property, negotiating a lease, or hoping for a short sale to gain relief from unaffordable mortgage payments, Fournier Law Firm, Ltd. can give you the advice and representation you need to protect your interests. If you are buying or selling a residential or commercial property in Darien, IL, protect your investment by retaining the services of an experienced real estate attorney. Call Fournier Law Firm, Ltd. at (630) 792-1000 or use our online contact form to make an appointment at our convenient Oak Brook office. Get the legal counsel you need to buy with confidence. Complete our Online Contact Form or call (630) 792-1000 now for a free consultation. You can speak with a knowledgeable attorney in real estate at Fournier Law Firm, Ltd. who has extensive experience serving owners and sellers in Darien, IL and neighboring communities. In addition to these services, the short sale lawyer at Fournier Law Firm, Ltd. helps sellers in distress with short sale transactions. Many homeowners who owe more on their mortgage than their house is worth have trusted Fournier Law Firm, Ltd. to negotiate a short sale with their lender. In some cases a short sale can prevent or end foreclosure. Our attorney understands the complex nature of this real estate transaction and will work diligently to help homeowners achieve a favorable outcome. If you have questions about a real estate issue and would like to speak with an attorney, complete our online form or call us at (630) 792-1000 now to receive more information and schedule a free, in-person consultation. 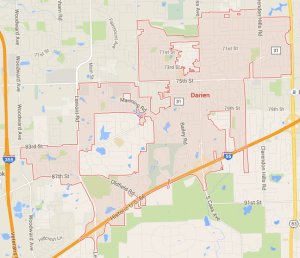 We provide assistance to real estate buyers and sellers in Darien, IL 60561 and surrounding areas.